Okay, so your racquet is not playing the way you want it to and this is what you do about it. Let’s say it has too much power, too little power, it feels unstable on off-center hits, it’s too light, it’s difficult to manoeuvre and so you start looking for a new racquet. Actually, you can try a lot of things to change the racquet characteristics before you decide to change it. What’s important for customizing a racquet to your preferred specs is that it’s not too heavy, because it’s hard to remove weight from a racquet (you could change to a thinner grip, but that won’t make it that much lighter), otherwise you can try a lot of things before you give up on your tennis racquet. Change string tension. Today low string tensions are all the rage when it comes to polyester strings. Lower string tensions are better for your arm and gives you more power. There are professional tennis players that string their racquets as low as 14 kg (Volandri) so here you can try a lot of things. Change strings. Some say strings are 70% of the racquet. No matter the percentages, strings can really change how your racquet plays. A stiff string strung at 60 lbs (or 30 kg) can murder your arm and get any racquet to play like a board, while a gut or multifilament string can soften a stiff racquet and make it play differently. Lots of softer polyester strings are now hitting the market to allow for spin and control while still being more comfortable on the arm. Add lead tape. Adding lead tape to your racquet is great for customizing weight and balance. Lead underneath the grip makes it more head light and easier to swing, lead on the throat of the frame makes it heavier but maintains the balance, lead in the head and gives you more power/stability depending on the placement. Adding silicone or tack (just added white tack to my frames and this increased stability, feel and made the more head light in a nice way) in the handle for increase comfort and head light feel. Most pro tennis racquets come from the factory weighing around 300 grams in a so called hairpin, then they put silicone in the handle, lead underneath the grommets and bring the weight up to more of a pro player weight. This is how they can match the racquets around balance and weight. If you racquet handle is not the right size there are ways on some racquets you can fix that too. Head and a few other brands have a pallets system where you can change the size of the grip. This sounds difficult, but is rather straightforward. If your racquet doesn’t have a pallet system it’s hard to make the racquet smaller but you can make it bigger by buying a so called shrink sleeve. It’s generally always quite easy to build up a racquet grip. You can buy a thicker base grip, add two undergrips etc, so better to choose a smaller grip than one that is close to being too big. 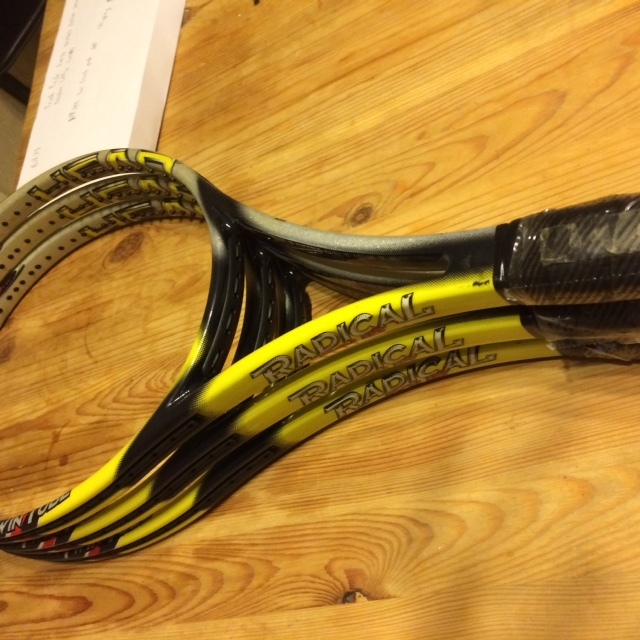 Here are some good videos on customizing your racquets. Enjoy! Personal preferences apart the Becker 11 special edition is the only retail customized frame I have seen that is close to a pro stock frame (djokovic specs)swing weight 377, flex 58 vs 370,60 and weight 357 vs 359 grams with the same string pattern. Pretty amazing the specs are so similar including the strng patterns since Boris used to play with a 16×19 as I recall. Interesting! Didn’t know about the Becker 11 SE. Sounds like a BEAST.